The ASL 624 Swivel Joystick Mount is a product that will allow you to mount a joystick in any orientation. With one turn of the small knob, the joystick can be rotated in a complete 360 degree radius. There is a slot on the side that will allow you to angle the joystick at 90 degrees. Once in the desired location, tighten the knob and the joystick will securely stay in that position. 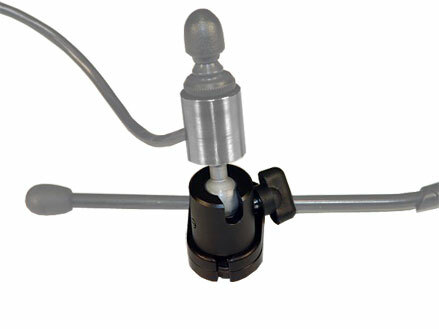 The small diameter and angle adjustability of this mount makes it ideal for chin controls attached to an ASL 625 Aluminum Collar Joystick Mount, ASL 628 Swing Away Adjustable Height Chin Mount or the ASL 613 Flex Arm Mounting Hardware and this gives precision mounting for clients with only fine motor control.